The lambs of New Zealand are here to protect your feet. eNZees is 100% natural lambswool that prevents blisters and hot spots with lanolin—the wax that keeps lambs’ coats dry. It wicks away moisture and reduces the friction that causes your shoes to turn against you. Tear off a piece, hold on your trouble spot, then slip on your shoes or socks. Dimensions: Wool coil length: 37"
I need a cpap machine at night and I put the wool at pressure points on the mask. No more sore face now. I always seem to get blisters when I don't expect them, so now carry around some of this Foot Soother in my purse for emergencies. Good stuff! 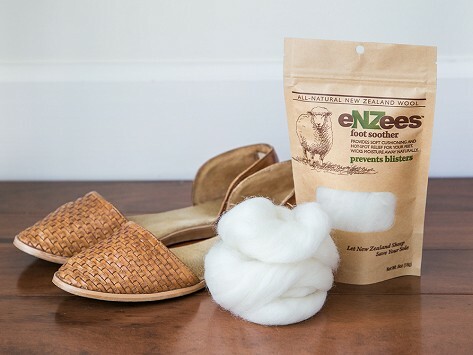 Whether you want to prevent new heels from pinching you or hiking boots from roughing up your feet, eNZees is 100% natural wool for blister relief. Where does this wonder wool come from? The lambs of New Zealand. Their wool is coated with lanolin—a wax that sheds excess wetness and keeps them dry. The lanolin works just as well for you, wicking away moisture and reducing the friction that causes blisters and hotspots. To use eNZees, tear off a piece of wool and place it on your trouble spot. Keep it in place while you put on your sock or shoe. It provides a comfy cushion and, if you are wearing socks, will even weave itself snugly into the fibers. The wool is humanely sourced in the spring, just in time to trim up the lambs’ coats so they’re less prone to summer heat strokes and unwanted insects. Maker Jill Schuman was first exposed to this age-old remedy before a 27-mile trek up the New Zealand mountains. But eNZees is good for any blister-prone activity, from dancing to commuting. This pain-stopping wool is as kind to the lambs as it is to your feet.